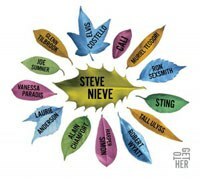 Steve Nieve is an interesting fellow: a classic – in the true sense of the word (he’s a Royal College of Music student, natch) -- pianist and keyboardist; long-time associate of Elvis Costello and the latter’s collection of musical accompanists over the past three and half decades; and resident of France, with his wife and collaborator, Muriel Teodori. ToGetHer (ghastly pun) is not Nieve’s first solo outing. He’s issued inter alia a covers album and a classical opera. The latter recording was performed with various singers; and Nieve has adapted that approach for what is a more straightforward (but not too straightforward – read on) pop album in ToGetHer. You can approach this album from two levels. Go in at the macro 36,000 feet, and the songs can lack a guiding narrative and seem to jump around in style. Take the first two tracks: "Save the World", featuring on vocals Tall Ulyss from French band Tall Ulysses, actually carries echoes of the Take That “Save The World” single before dissolving into a bit of a fuzz thrash; this is followed by "Conversation", featuring the voice of Vanessa Paradis, an altogether more lad-back affair which is almost submerged by its murky gloomy atmosphere, redolent of a fog coming down and not going away. Likewise, there is quite a contrast between track three, "You Lie Sweetly", which has Sting rather uncomfortably singing in a low throaty register over some doomy keyboards; whereas "What a Holiday (Pandemonium)", American singer-songwriter Harper Simon on vocals, is a distant cousin of the Rembrandts’ “I’ll Be There for You”, all upbeat guitars and a coda which frankly lasts too long. Good or great albums don’t have to have a sense of continuity – a quick glance at the track-listing for the Beatles’ Revolver would confirm that. But they do need an identity; and it’s only in the second half that ToGetHer strikes something of an identifiable groove There’s an atmospheric feel around the French song cycle that Nieve has written with Teodori which is both soothing and beguiling, transporting you to a place where life is good – the sea is lapping gently 100 yards away, the sun is going down, the red wine’s in the bottle, somewhere like the south of France in fact! The penultimate song, Summer Song, sung by an old mate of Nieve’s, Glenn Tilbrook, over some lovely shimmering guitar, carries that same beach feel. But maybe it’s unfair anyway to try to judge ToGetHer on the sum of its parts. A piece of work can be legitimately assessed for its stand-out moments, and there are plenty of those – mostly reminders of what a class musician Nieve is. The farfisa organ on "Conversation"; the perfect spacing on "Tender Moments" (the one track with Elvis Costello on it, pop-pickers! ); and then the stand-outs – "Vertigo", featuring Laurie Anderson, and "Halloween (Bonfire Night)", sung by Ron Sexsmith – which are delicate, sedate (in a positive sense), and both convey a yearning love of, yes, togetherness. A yardstick of good music is that it leaves you wanting more. In one way, ToGetHer doesn’t do that: It’s arguably over-long and could have benefited from a little slimming-down. But it does in another sense give the listener wanting more: to give some of the best tracks another hearing and then another. Nieve’s best songs on ToGetHer have a richness that is worth savouring. After a chameleon-like solo career, he may have found his metier. Overall, an unexpected pleasure.